Dynamix - Teambuilding for Kids and Teens! : Olympics 2010 - Go Canada! The Olympics are finally upon us! 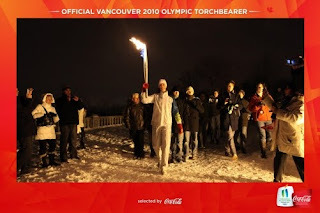 On Friday night, Feb. 12, 2010, the opening ceremonies will begin and the Olympic Flame will finally light the Olympic Cauldron in Vancouver. After over 100 days and travelling 45,000km!!! We, at Dynamix, are proud to have had the opportunity to play a role in the Olympic Torch Relay. As many of you already know, Dynamix had been given the privelege of bearing the olympic torch as it passed through Montreal. Coca Cola and RBC selected Dynamix for its positive impact on society and its youth. So, to get you in the Olympic spirit, we've posted a fun video that documents Allison's experience carrying the torch for Dynamix. Enjoy!